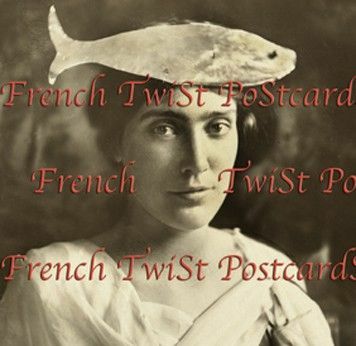 Victorian postcard of a woman with a fish hat. Wow. That’s totally amazing, Erica! I never saw a woman with a fish hat aside from myself . . . a few years ago I decided to do a photo series of me (well, I didn’t know anyone else who would pose) with fish hats. I made one out of squid (it was very nice) and another out of shrimp and a long unidentified skinny blue fish from the Asian market. It was fun but somehow I dropped the project. Thanks for posting this, it’s fun to see. This one looks to be made from some type of fur. This is an ongoing feature on my blog (I have no idea why, but it is). If you’d like me to post one of your fish hat photos, I’d be honored. Ah! I’ll have to browse and find the other posts. Great minds think alike, I guess. At the bottom right of my home page, you’ll see ‘Women with Fish’ Click where it says to and you’ll see all the fish ladies I’ve put up so far.